"Accepting us for who they are, that has a ripple effect on anyone around us. It's exponential." Talking about this is important for everyone, says Redfern. "Every single one of us has multiple identities." By building this capacity, you're also doing it for everyone else, not just LGBTQ2 people. "It makes space for every single one of us." "Our differences are also our gifts. And help to create a more complete circle in society." McNeil-Seymour says "its important that people see us" in their communities. He speaks about a documentary about a Hawaiian trans person who is a knowledge keeper, and says he connected to that. 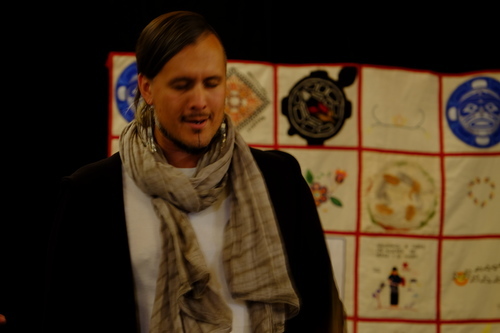 His identity as a two-spirit person is on the periphery. "What matters is how humble you are, and how you contribute to the community." "What's important is that we do what we can, and clear as much for a path for those behind us as we can, while taking care of ourselves along the way," he says. Robinson turns her next question to the topic of man camps. "You see this transient, gender imbalanced dynamic with segregation and gender isolation in a number of areas, not just the extraction industry." She references the construction industry in the North, the DEW line, and military in the North. She also refrences the early days of the clergy in the North and the RCMP up to today, historically within teachers, nursing, the Hudson's Bay Company and other industries. She asks if this threat to women and girls is happening within communities with these same characteristics - transient, primarily male groups. Lightfoot agrees. Robinson asks if we need to keep an eye out for this in every industry. Again, Lightfoot agrees. Robinson specifically asks if there are any recommendations for regulatory bodies like the National Energy Board, and how they can ensure the voices that need to be heard are there. Lightfoot begins by speaking about the Nunavut Environmental Impact Review Board. Often, the board hears the voice of the HTAs and groups like Pauktuutit. The board does hear from communities, they say, but they're also under pressure from federal agencies. In their opinion, it's not actually that board that needs to change, it's the federal agencies to stop and listen to what the board is saying. Redfern says that she wishes there was more accessibility to community consultation. Often in the evenings, for example, she is taking care of her children, and so she has to make a decision about properly caring for her children or going to meetings. She suggests better accessibility of advance materials, and ensuring consultants are more aware of the need for child-minding services at these consultations. She also suggests that regional Inuit organizations create one-pagers that can help people decide which meetings impact them and which ones to go to. McNeil-Seymour says that in his territory, the number one resource coming out in 10 years will be gravel. "Gravel pits all over our territory," he says. "That's not OK."
"I think that if these bodies can't immediately answer how they've answered the calls to action from the TRC, then they're not starting from a good place," he says. 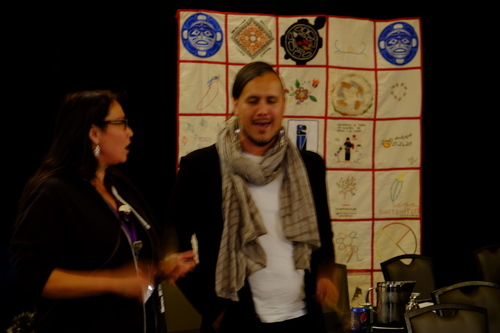 "Restorative projects, reconciliation projects... there should be some sort of measure of authenticity and accountability put into these measures of relationship building." One final question from Robinson. "I have a thought, and I want to know what you think." She says that we hear often that industry promises to create jobs in an area, and people feel as if they have to say yes to that in order to address poverty. However, much of that poverty is associated. She then says that the wage economy is also problematic, in disrupting traditional community roles, family and relationships. "There's this disruption and denial of place and purpose." She wonders if the wage economy is disrupting revitalization. "Am I off the mark?" She asks. All of them say no, she isn't. 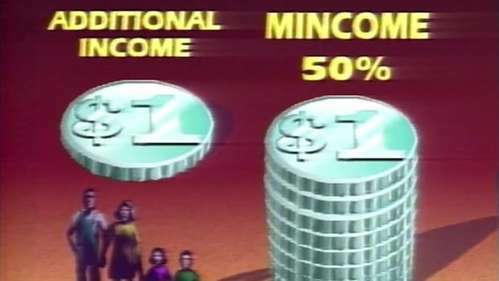 CBCIn 1985, The Journal looks back at Manitoba's 1970s experiment with "Mincome" -- an annual wage for the working poor. She asks the panel what they think about this idea in terms of creating safety. McNeil-Seymour talks about a traditional food share in his community. "It's beautiful, that giving economy. We need to bring that back." Lightfoot says that Robinson may be pointing to Marxist theory: the capitalism creates alienation, and alienation from environment. They say they do support the idea of a basic wage, but one that is meaningful and includes housing and food sovereignty. "If we're helping to make them well, and we're well, then how much greater can things be?" Redfern speaks about hunters who provide for their entire community, some of whom rely on income assistance. "The potential I see for a guaranteed basic income is we compensate fairly for those who provide for the community. Because people deserve dignity in what they do." It's now Commissioner Buller's turn to ask questions. She asks Redfern for examples of "health seeking behaviours." These include going in for routine checkups, STI checks, accessing mental health services. She is arguing that these activities should be normalized. At the moment, she says, they're stigmatized, especially in small communities, where going to the health centre can bring the assumption that you are unwell. Buller is attempting to clarify main messages from the panel. 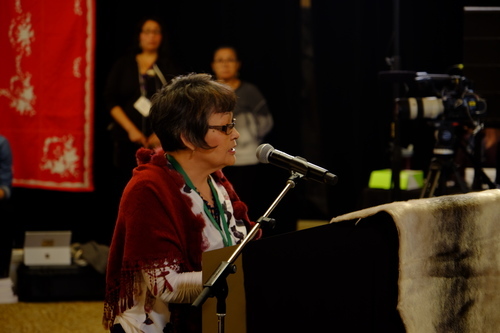 She's asking if the panel is suggesting that Indigenous people must work as full, equal partners with government to eliminate barriers to health, housing, and services in order to decrease the vulnerability of Indigenous LGBTQ and two-spirit people. The panel agrees, but McNeil-Seymour says that access to education and ceremony should be included. Lightfoot suggests adding acces to land, and the ability to consent over whether or not they are used. Redfern suggests access to history, and traditional knowledge. Buller asks if there are any other comments. "We're just 3 people doing our very best to bring forward the stories, the realities of the people in our lives who have gifted us with their stories," she says. She addresses a message specifically to those in their communities. "I hope we've done a good job, and I've done my best to share the stories of the people in my life." Buller's questions are now completed. That will complete the final panel of this hearing. McNeil-Seymour is about to perform a traditional honour song before the closing ceremonies. "And with that, we are adjourned until Quebec City," says Chief Commissioner Buller. We are in a short break now before the proceedings today wrap up with closing ceremonies. We are back and getting rolling with closing ceremonies. Thanks being offered to everyone, beginning with the interpreters. They really have done yeoman's work over the past four days. It's been a ton of discussion, mostly in English. Thanks now being offered to hotel staff, AV people, other staff. Micah Arreak, a member of the National Family Advisory Circle, now making comments in Inuktitut. "I was hit in residential school for speaking my language, so now whenever I can, I speak Inuktitut," she says. Arreak gives thanks to those in attendance. "There's a day for everything. Today is our day as Inuit." She says she's grateful for Inuit to given a place in these forums. "If you have a cut anywhere, we bleed the same colour." She speaks about the importance of keeping kinship terms - names in the Inuktitut language that can identify exactly how people are related to one another. "Everything comes around," she says. "For example, the sun is always moving in a circle. Life is like that also." She speaks about the importance of supporting family members if there is a death in the family, in particular communicating a death to the family. "Because that's not working right now." She thanks everyone for attending and for coming to Iqaluit, "because now you understand what it takes for us to come down there. It takes 2 to 3 days for us to go down south." She thanks everyone, especially those who approached her. She says it's been seven years since she lost her daughter "and I haven't been to Iqaluit since then, because it was always dark. But now I'm here, and I was happy to come, and it looks very bright. The sun is out in Iqaluit." 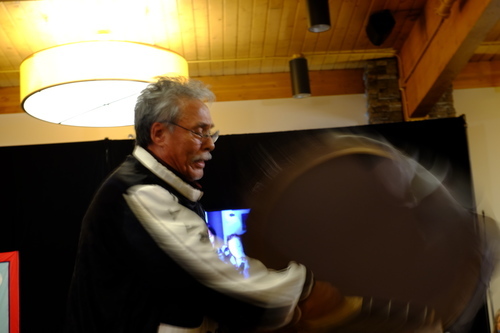 Next up is a traditional drum dancer, Jacopoosie Tikilik. Tikilik is from Pangnirtung. 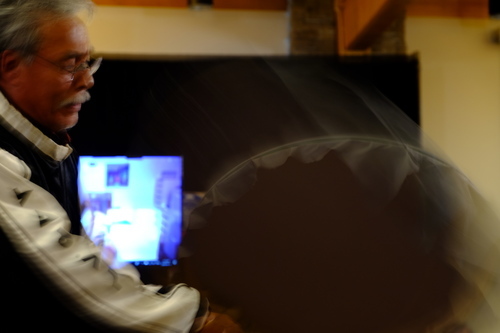 He says that there has not been drum dancing in the South Baffin for many years. Two young throat singers will now perform.